With the current discussion of the upcoming GTAIV trailer overshadowing all other news at the moment, some of you may have forgotten that in the next week Vice City Stories will be released on PlayStation 2. Rockstar have recently released the official trailer for the game, and SPOnG seem to have an exclusive on it at the moment, hit the link below to check it out. 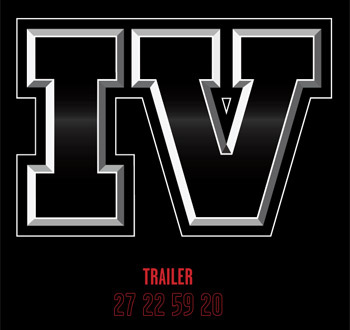 Some exciting news for you here folks, Rockstar have updated the official site with a countdown to the first trailer! The URL has changed to end in "IV", and an improved logo is now in place with the time underneath counting down to the 29th March at 11pm GMT (you can work out from this what time it will be for you). Could "IV" be something more significant than just '4'? Check it out at http://www.rockstargames.com/IV and discuss this exciting news in our forums. Last night Take Two reported their Fiscal 2006 Financial Results. If you're familiar with these press releases you'll know that Take Two like to talk about the games which they sold during the year, as well as upcoming products which are in the making. 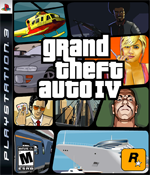 A small mention of GTA4 revealed that the game would receive episodic content some time during 2008, rather than being available from the initial release. Starting in 2008, Rockstar will introduce exclusive episodic content downloads for Grand Theft Auto IV. That was all that was said about the matter. There's still no confirmation on whether the PS3 version is going to get any content, or exactly what the content is. Stay tuned as we'll have more updates on this as they are released. GTA IV To Use NaturalMotion's euphoria Engine? Oxford, UK-Feb 27 2007- NaturalMotion today announced a partnership with Rockstar Games, Inc., the world-renowned publishing label, to integrate NaturalMotion's revolutionary euphoria engine into upcoming next-generation Rockstar Games titles. Rockstar's integration of euphoria is well advanced, with today's announcement following several months of close collaboration between the two companies. Announcements regarding specific titles will follow at a later date. So essentially, you shouldn't see the same movements twice from characters, it will always be different just like in real life. It would certainly make for some very interesting game experiences. We may also see this technology used in some of Rockstar's other upcoming games such as LA Noire. See more on our Vice City Stories PS2 Screenshots page. Thanks GTA-Addic for the heads up. This GTA San Andreas mod will turn your bmx bike into a new lowrider bike. It features colored by carcol file textures that can be changed to what ever color you want by just editing the carcol text file. This mod can also replace the bike instead of the bmx by just changing the names of the dff and txd to bike instead of bmx but the bike in San Andreas unlike the bmx is not carcol color controled and no matter what I did I could not get the original bike or my lowrider to change colors in game. I'm starting to think that the bike vehicle in GTA is hardcoded to one color because changing it's carcol entry does nothing, so that is why I had it replace the bmx instead so we could all have different colors. The seat and grips are secondary carcol colored and the frame is primary carcol color. and you can purchase the model for use in other applications here. You may have read on various websites and forums on the interwebs over the last few days some juicy rumours regarding new content and multiplayer modes in the PlayStation 2 port of Vice City Stories. Thanks to Eurogamer, we can confirm that sadly, none of them are true - the only improvements you'll see will be to the graphics, and increased draw distance. Eurogamer were able to get word from Rockstar debunking these rumours, and while there were no comments specifically regarding what seems to be an error on Take2's Italian mirror, it sounds like there won't be any exclusive content in the game either. However, we'll have to wait for more confirmation on this though. Courtesy of PlayStation.com we now have the first few screenshots showing the PS2 version of Vice City Stories. Nothing special at the moment, hopefully we'll have some better ones soon to show the small graphical improvements. Posting fake screenshots is something normally limited to times of slow news, but this fake box art for Grand Theft Auto IV, made by SlimTrashman, is so good even sites like IGN decided to post it. Although made 3 weeks ago, it wasn't until QJ posted it this weekend more or less thinking it was real that it became big news on gaming sites. Others realised it was fake, and earlier today QJ posted again, confirming what everyone already knew. The box art itself is shown below, along with the Xbox 360 version. You can read more about how Slim made these by visiting his DeviantArt page, where he claims it took him between 6 - 7 hours to complete. But then it is probably the best fake box art you'll ever see. An interesting discovery recently made by Italian fansite GTA-Series suggests that the PlayStation 2 version of Vice City Stories may feature some exclusive content, not seen in the PSP version. Not all of Take2's localised websites have been updated with this information yet, but the Italian mirror has (here). The first point of interest is that it states the PS2 port features various graphical enhancements - these will probably be in the way of increased draw distance and such. The more interesting point is the mention of exclusive content. In Italian "Numerosi i contenuti inediti, esclusivi di questa versione per PlayStation 2." - which roughly translates to new content, exclusive to this version for PlayStation 2. Rockstar have updated the official site for Vice City Stories recently with a small but surprising piece of news regarding mobile phone content now available for your cellular device. A mobile site has now been set up where you can purchase a variety of Vice City Stories artwork to adorn your phone's background with, as well as a few sound clips from the game, including the theme tune. All the items are priced between .99 and .99, and are unfortunately for those who are interested, only available to those of you living in America. For those of you who don't want to shell out any money, or who don't live in America, then we can offer you the GTA3 Pager beep as a ringtone. A nice bit of nostalgia for you there. Take Two have (finally) published a press release announcing Grand Theft Auto: Vice City Stories for the PlayStation 2. A move which ends months of speculation from fans. As far as release dates go, Rockstar have said "the title will be available in North America on March 6, 2007 and will be on European retail shelves on March 9, 2007." A price has not been set for the game. We'll be bringing you the latest news and updates regarding what will most likely be Grand Theft Auto's last outing on the PS2, Vice City Stories, here at TGTAP. The British Board of Film Classification (BBFC) have today published a listing for Vice City Stories, in which it seems to have kept the 18 rating which it received for the PSP version - presumably this re-rating must be for a PS2 version. In addition to this the Office of Film and Literature Classification (OFLC) in Australia have given their rating of the PS2 version of Vice City Stories, the game received an MA15+ rating. We're assuming that Take Two will make an official announcement on the game when the time is right for them, stay tuned for more updates soon. In my previous post this week I reported on the release of GTA: San Andreas in Japan and how it was doing surprisingly well. It now seems the Japanese just can't get enough of it. San Andreas topped the sales charts for the week beginning January 15th - January 22nd for all console games, which seems to be quite a rare achievement for a westernised game. A total of 227,261 copies are said to have been shifted that week. It's fair to say that San Andreas has enjoyed a lot of coverage out in Japan, even in the pre-release stage these buses were covered in an advertisement for the game, as are these trucks currently roaming around. This is probably the last piece of news we'll be posting for San Andreas, so it's safe to assume we're now turning our full attention to GTA IV. Stay with us for all the latest news and factual information on GTA4 we'll be finding later in the year, we're sure to be one of the primary resources for everything related to the game. Thanks Laz for the heads up.